John J. Krajewski was born on March 27, 1931 in Chicago to John and Adeline (nee Kosturkiewicz) Krajewski, Sr. 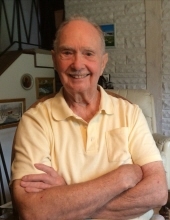 He died Wednesday, January 30, 2019 in Arlington Heights. Mr. Krajewski worked as a Polymer Chemist and Research Manager having worked at Swift Company, IMC, Desoto and Allied Chemical. John was a member of the American Chemical Society, He had many patents in chemical polymer development. John was a 4th Degree Member of the Knights of Columbus St. Elizabeth Ann Seton Assembly #2410. He was a Minister of Care for the Archdiocese of Chicago. John enjoyed painting, playing piano, and making homemade sausage and pierogis. He loved picking mushrooms in the woods, golfing and fishing and had written many bedtime stories for his two grandchildren. John is survived by his wife Jacqueline Krajewski (nee Walczak); children, Christopher Krajewski and Carolyn (Greg) Johnson; grandchildren, Hannah Johnson and Nathaniel Johnson; brother-in-law, Steve (Linda) Heinz; and many nieces and nephews. He was preceded in death by his parents; brother George Krajewski; and sister Mary Heinz. Visitation Friday, February 8, 2019 from 3:00 pm until 7:00 pm at Glueckert Funeral Home Ltd., 1520 North Arlington Heights Road (four blocks south of Palatine Road), Arlington Heights, IL 60004. Visitation, Saturday, February 9, 2019 from 10:00 am until the 11:00 am Funeral Mass at St. Mary Parish, 10 N. Buffalo Grove Road, Buffalo Grove, IL 60089. Interment at St. Mary Parish Cemetery. In lieu of flowers, memorials may be given to the St. Vincent de Paul Society, c/o St. Mary Parish, 10 N. Buffalo Grove Rd, Buffalo Grove, IL 60089. "Email Address" would like to share the life celebration of John Joseph Krajewski. Click on the "link" to go to share a favorite memory or leave a condolence message for the family.